Treachery Camp is a privately owned property a kilometre down an unsealed road from Seal Rocks. I think I’ve been going there for over 20 years now so the chance to have a quick weekend getaway was jumped at – a Dads and kids weekend. Approximately 4 hours north of Sydney, Seal Rocks is a little village with caravan park, and general store, just north of the Myall Lakes National Park. Twenty years ago it was quite an adventure to get to but the improvements to the Pacific Highway in recent years, plus completion of a sealed road to Seal Rocks in the last two years have opened the area up to everyone. Because of this the camp was busy, much busier than I was used to. We found a large spot near the billabong, in a forest of paperbark trees, which in prior years I would have avoided for an abundance of mosquitos. The billabong itself was barely a puddle left, and full of tiny fish, but the marks on the trunks of surrounding trees belied days when it was over 1m deep. Camp went up, the boys went off exploring, the campfire started and Simo set a high standard with his curry for the first meal. The boys found sticks and the obligatory marshmallows over the campfire saw the night draw to a close. First thing Nick braved the surf at Treachery beach but after breakfast we headed for the more protected waters at Seal Rocks where the boys swam, paddled and tired themselves out. A friendly Kookaburra visited my rear tyre and coughed up it’s equivalent of an owl pellet – full of beetle shells, leaving it on the tyre. The big sand dune between camp and the beach is a huge draw card for the kids, as they run up and down in the heat of the sun. Some of them even got an introduction to sandboarding by a man who makes them, and soon enough the youngsters were speeding down the dunes extolling the virtues of the board. The short walk to Treachery Head offers magnificent views back to Seal Rocks lighthouse, and Lighthouse beach to the north, with Treachery beach to the south. In calmer conditions in the past I have watched whales and dolphins playing in the waters just off the headland here. I had heard dingos inhabited the area but had never seen one at Treachery before. Maybe it was because we were close to a place called Dingo Flats but we had a few visits by very wary dingos cruising past looking for an easy snack – none around six very active hungry boys! Then there was the obligatory snake sighting, a red-belly black snake cruised through the camp followed by the curious boys, careful to keep just enough distance to be safe. I was surprised how crowded it was but even then our stay was pretty peaceful in the magical forest and all the mosquitos, it turned out, had moved to live in the toilet block! Still beautiful but changing fast. As we drove back to the Pacific Highway we diverted the 5km to see the 400 year old Grandis tree, once claimed to be the tallest tree in NSW, but since exceeded by some remote tree back in the Blue Mountains. I found a bucket full of zip-lock bags in the garage at the weekend. Each bag was carefully filled with coloured sands from our trip. The kids were excited to see them resurface, many of which had been squirreled into recesses in the trailer for some time. As we each only had limited space all got quite skillful at determining what they wanted to keep, and if required, tough decisions would be made to keep something or substitute it for a new arrival. Very precious finds would also be posted home every now and again! 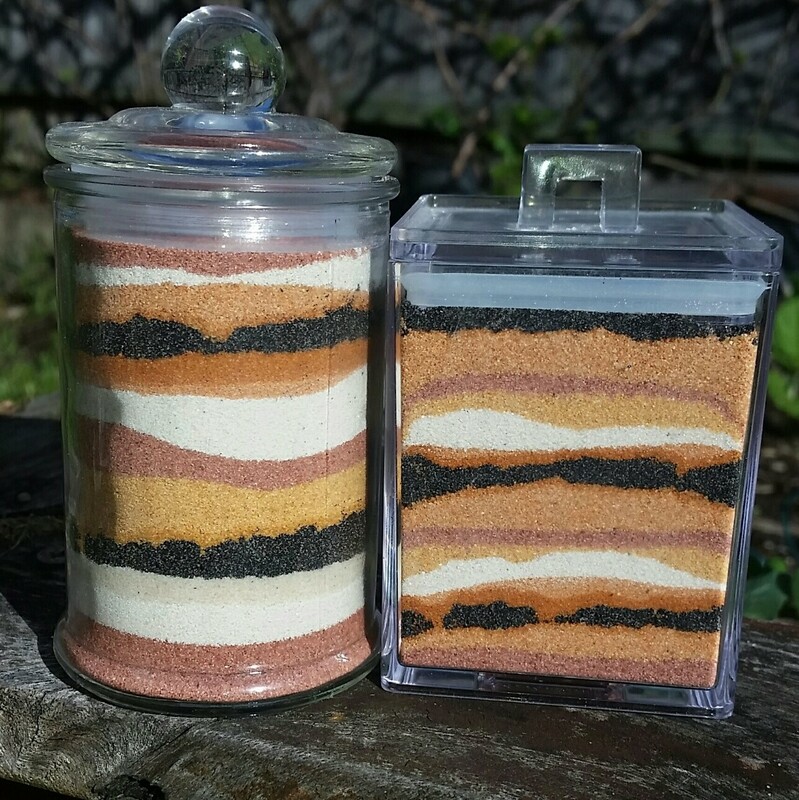 The sands had made it and with some suitable jars a very attractive display resulted. There is a saying that if you take sand or soil from a place you will be destined to return one day. Maybe that’s why so much came back with us! As the weather deteriorates here in Sydney, with the arrival of winter imminent, our thoughts returned to those warmer places we visited last year as the temperatures started dropping. One of our favourites was a small eco-resort called Goombaragin, where we camped for a few days with two other families we had met on the road. Our hosts Cathy and John were very welcoming, showing us some of the local ways and putting on a communal campfire in the evenings for everyone. The area is magnificent to explore, and it is even safe to swim here from the beach. Heed the crocodile signs in this area though, particularly around the rivers and mangroves. It’s a rugged road from Broome but still relatively accessible if you drive carefully. Look out for the Ardi festival around June, when many local artists from across the peninsula display their talents.